Chicken and rice are two things that go very well together. 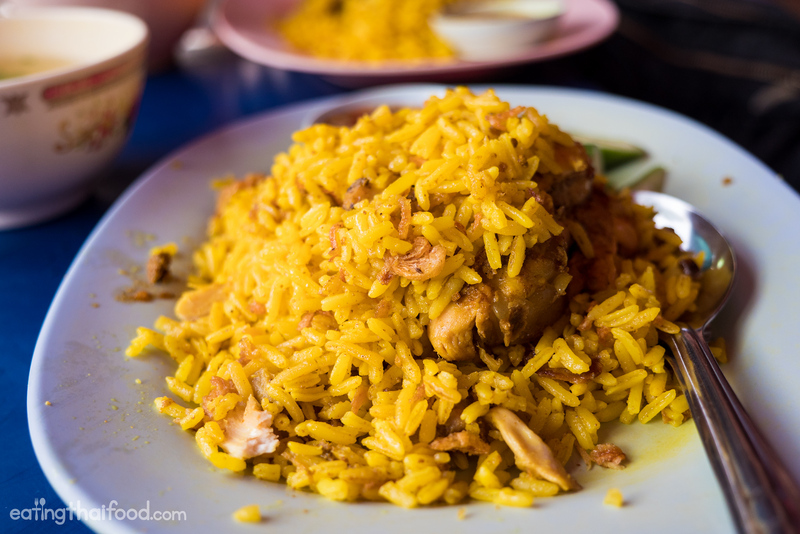 And while khao man gai (usually boiled chicken and rice) is constantly available as a street food dish throughout Thailand, khao mok gai (ข้าวหมกไก่), which is the Thai equivalent of chicken biryani rice, is typically a dish I enjoy more – because of the spices used. One early morning, while wandering though Silom Soi 20, a great local market right in the heart of downtown Bangkok, I tried a stall called Khao Mok Gai De (ข้าวหมกไก่ เด๊ะ), serving Thai chicken rice biryani from a big pot. On my first bite, it proved to be one of my favorite plates of Thai biryani in Bangkok so far. 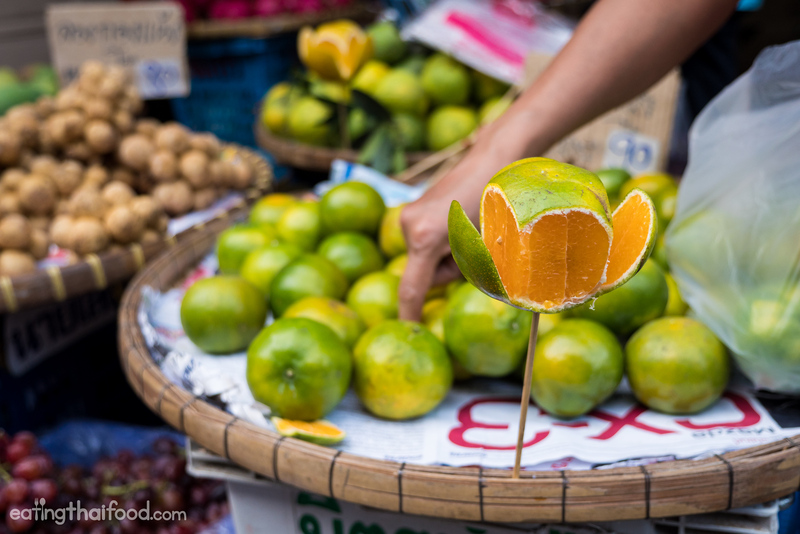 If you’re in the Silom district of Bangkok and looking for an authentic, friendly, and great morning market environment, Silom Soi 20 is a great place to explore. 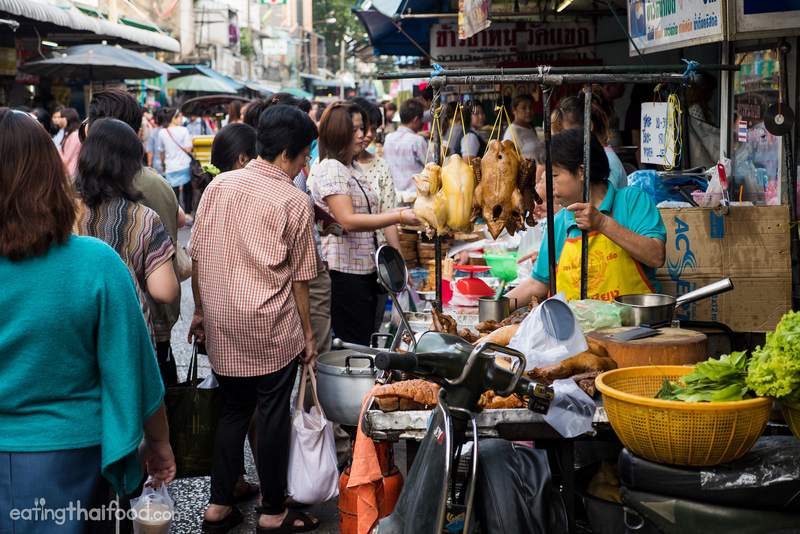 Even though it’s in the downtown district of modern Bangkok, every morning you’ll find a bustling traditional food market along Soi 20. There are all sorts of cooked food, including one of my wife’s favorite black sticky rice and custard stalls at the front of the street, plus fresh vegetables and fruits, and some meat vendors as well. One of my current favorite go-to stalls at Silom Soi 20 morning market is Khao Mok Gai De (ข้าวหมกไก่ เด๊ะ), serving Thai style chicken biryani (khao mok gai ข้าวหมกไก่). It’s so good, the lady selling it, typically sells out before 9 am each day. 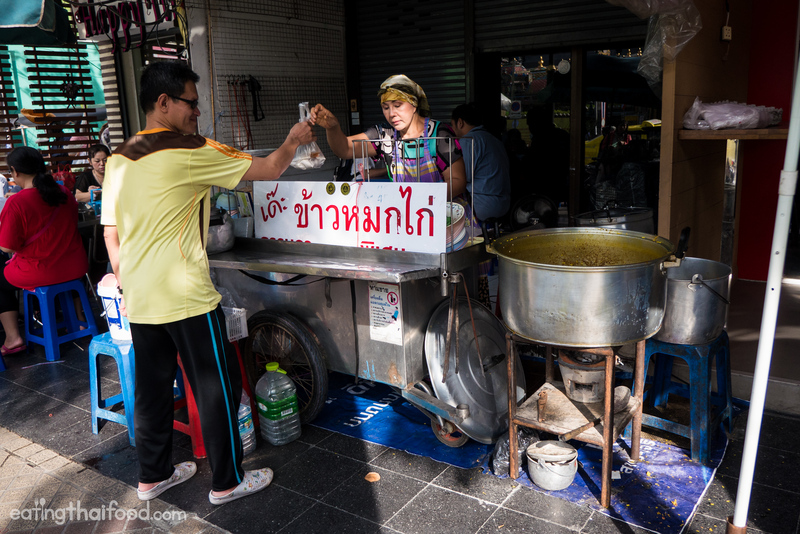 If you’re facing Silom Soi 20, the stall is along the main Silom Road, just to the left hand side a few meters. You’ll see a street food cart set up along the sidewalk, within the entrance-way of another business, which doesn’t open until later in the morning. 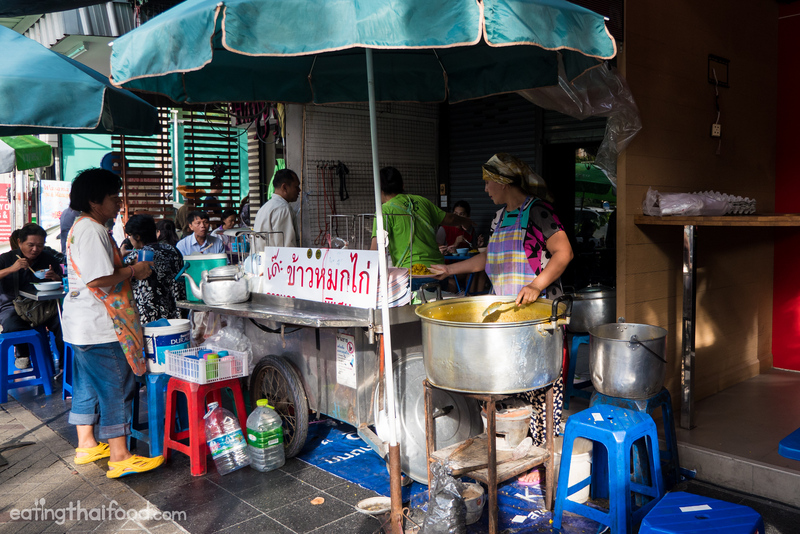 The stall is nearly always busy from as soon as it opens, and many people choose to buy it for takeaway for lunch later on, or there are a couple tables set up where you can eat a wonderful Thai breakfast right there. As soon as you order, she grabs a plate, and artfully and rhythmically, scoops on some fragrant rice and a piece of chicken, all while hitting the side of the giant pot with the spoon (I think to clear the rice off the spoon, plus to make an enticing chicken biryani sound to associate with the food). Once finished scooping out the perfect plate of khao mok gai (ข้าวหมกไก่), she then added on a few slices of cucumber to garnish, plus a side dipping sauce. There are just a few components to any plate of khao mok gai (ข้าวหมกไก่) – the rice, chicken, soup, sauce, and some small garnishing vegetables. The rice is what really stood out at Khao Mok Gai De (ข้าวหมกไก่ เด๊ะ). It was Thai style rice (not basmati like some Indian versions of biryani would use), yet it was cooked quite fluffy and moist without being too wet. It was also extremely fragrant, perhaps cooked with chicken stock and a very pleasant blend of dry curry powder and plenty of turmeric. As for the chicken, it was coated in the same spice blend as the rice. I got a breast piece of meat, and it was cooked through, but not dry. 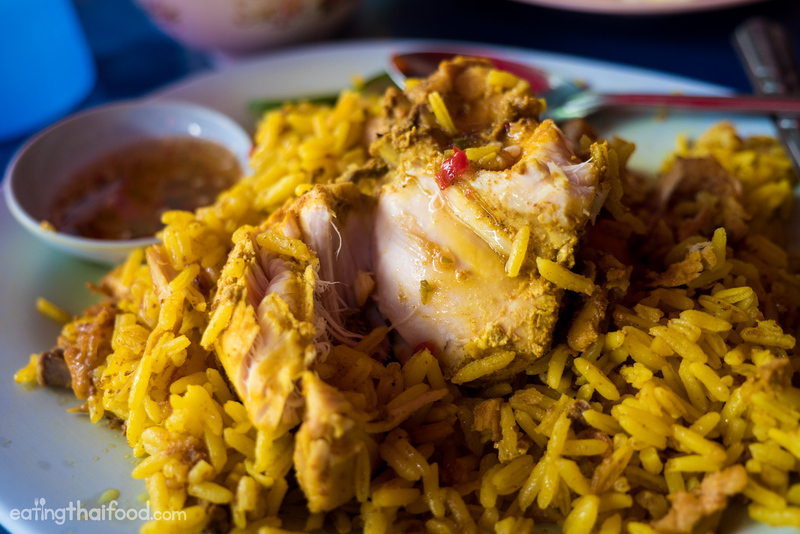 Compared with other versions of Thai chicken biryani, this was one of the most fragrant, heavy on the dry spices, that I’ve had before, and I thoroughly enjoyed every bite of it. The sauce, which is one of the undeniable Thai distinctions, was sweet and sour, with crushed chilies. Sometimes the sauce in Thailand can be more of a mint cilantro sweet and sour sauce, but this was more of just a chili based sweet and sour sauce. I’m not huge on sweet sauces, but a little drizzle of the sauce on the rice and chicken balanced out the spice flavor nicely. The generous extra piece of chicken! When I was taking pictures of my plate of khao mok gai (ข้าวหมกไก่), the owner came over to me and added an extra piece of chicken to my plate, saying, “only take a photo if it looks pretty,” – in a smiling motherly kind of way. That kind generous gesture of giving me an extra piece of chicken, elevated the plate of biryani and the experience even higher. 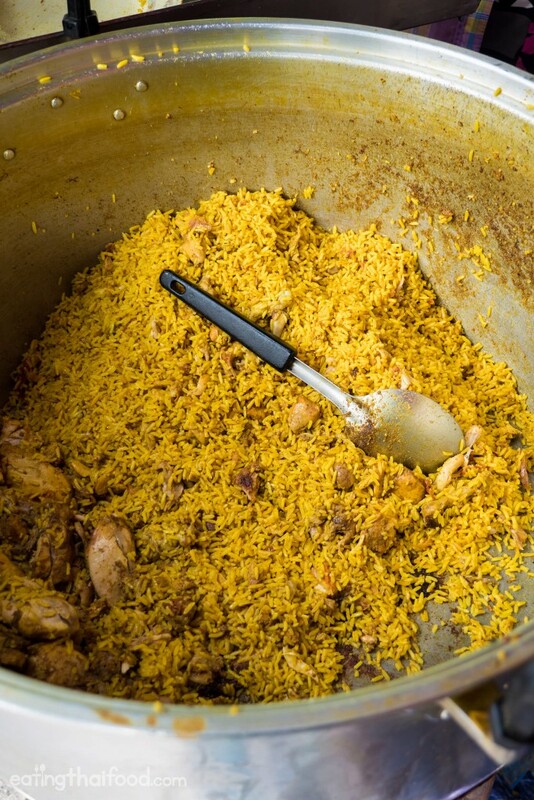 Biryani, originally a dish from Persia and India, is also very popular in a variety of forms throughout Thailand. 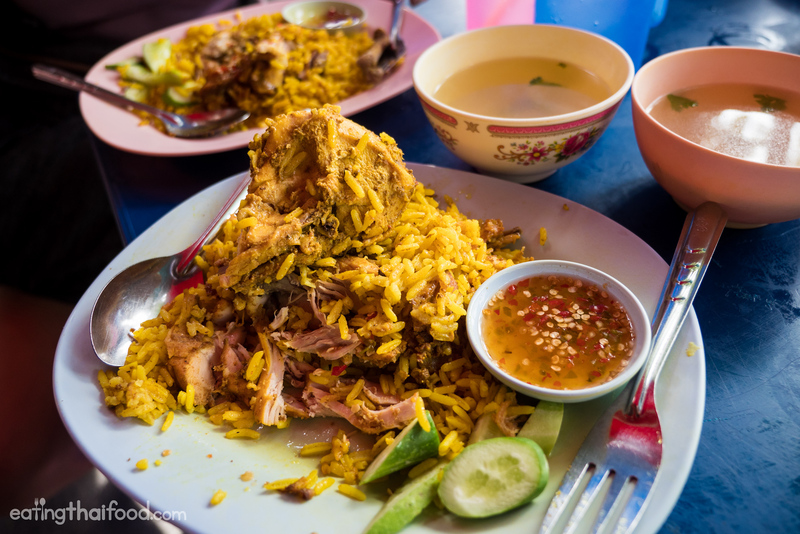 I typically love to eat Thai goat biryani, but on Silom Soi 20 one morning, I had a plate of chicken biryani at a stall known as Khao Mok Gai De (ข้าวหมกไก่ เด๊ะ), and it was one of the finest plates of Thai chicken biryani I’ve had in Bangkok. 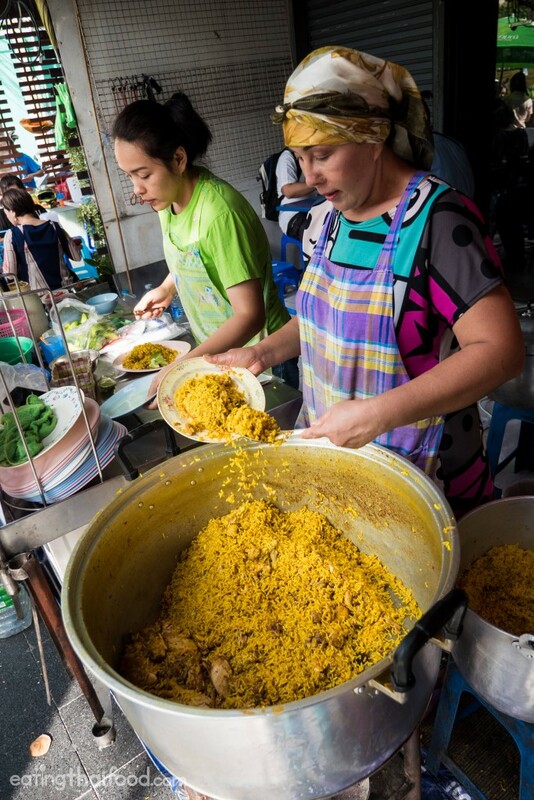 If you go to Bangkok’s morning market on Silom Soi 20, don’t miss a plate of deliciously fragrant khao mok gai (ข้าวหมกไก่). Just make sure you get there early, around 7 – 8 am, or it will sell out. เปิดบริการ อังคาร – อาทิตย์ (หยุดทุกวันจันทร์ ) 6.00 – 9.00 น.
Hi Mark! I’ve been really a fan of your youtube videos. especially featuring Bangkok. I’vebeen watching you likealmost everyday since I am preparing my DIY itinerary. Me and my partner will be in Bangkok for 7 days in March 11-17, it will be our first time there so we will probably try this.hopefully we findthis stall. we will definitely eat and eat and eat there, that is our first purpose in this travel. haha you’re videos really helped us and encourage us to visit andenjoy Bangkok. I have been traveling to Bangkok regularly and during the past 7 years or so have stayed at 222 Hotel, which is just next door to Silom Soi 20. I have had many lunches at Soi 20 but have never had any breakfast. This time, after reading your articles it has inspired me to book room only at 222 and try out the Biryani and other Thai breakfast dishes there. Please do recommend some Thai Breakfast menus I can find in Soi 20. At glance thanks to you for discovered this food.I went on last Saturday 12 Nov.Just to taste how wonderful the taste after read your stories here and the video on Youtube too.I came here as early as 7.30 am walking from BTS Saladeang and it total worth enough ! It so flavorful , pack with harmonies herb plus the chicken so tender i must said. Upon arrived i was great in thai language tho.Perhaps as malaysian we share same look haha ! The order also quite fast and i get two packs and dig at my hostel.Overall it is a good as you mention before.Thanks a lot ! Keep discover …luv ur stories. Hey Aizam, awesome to hear you found this little place and enjoyed the Thai style biryani! Last summer we stayed almost a week in the furama silom hotel, opposit soi silom 20. Only one night we did not eat in soi silom 20 (we were away on a short trip). We enjoyed the food, the atmosphere and the people working there. A great place to eat (thanks to you, Mark!). Hi Fred, great to hear that you had such a good time eating and exploring Silom Soi 20. I enjoy how it’s right in the middle of downtown Silom, yet it has a neighborhood feel to it. Would be great if you can embed these random little places on a Google map, Mark! Keep up the Buddha’s work! Hi Steven, thank you. Here’s this place on a map: https://www.google.com/maps/d/edit?mid=zVNnT-rsv9kU.k6PLCqNEPqEE&usp=sharing But with the Google maps update, it makes it a bit confusing… I haven’t figured out a way to make one map like this and embed it so it shows right on the correct location for the place. So I’m still trying to find a better map solution. Thank you for your support! You’re welcome Chad, it’s worth it!